Are you raising a millennial? Things certainly are different than when we were growing up when it comes to careers! When I was in high school it was all about going to college, and there were not many other acceptable options. Today things are much different. My son has decided to enter into a trade and I support him fully. He just turned 16 and will begin shadowing others in different trades to see which ones he connects with. I support him with his plans, and love that he is looking beyond what it considered a normal path to an expected career, to one that will bring him happiness and fulfillment. I decided to take his lead when he spoke about jobs, and let him explore. It wasn’t always easy, though. In fact it was a struggle, especially when others who are “professionals” in our family, to let HIM decide where he wants to go. Not sure how to do it? Here are some excellent tips from career coach Alissa Carpenter. It’s essential to create a trusting an open environment for your child. When they come to you with a frustration about their work day, take the time to listen and not provide suggestions unless they directly ask for them. Provide a space where they don’t feel judged and feel understood. Be vulnerable. They know you for you now but weren’t there when you struggled with your first job. Let them in on your first conflict with a supervisor, a time you got fired or a job that just wasn’t the right fit. Unveil the curtain a little bit to give them more of your vulnerable and real self. 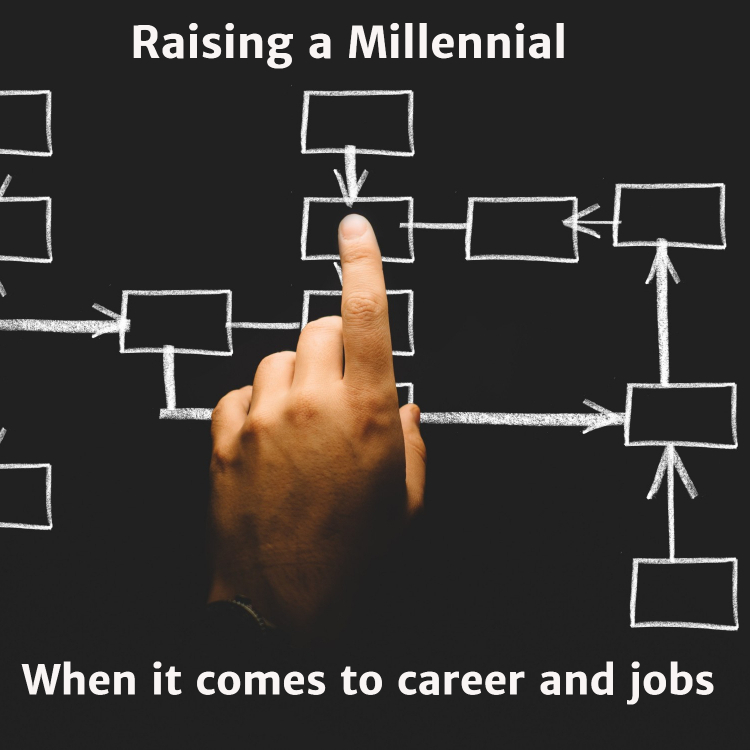 Millennials and Gen Z want to make a difference, feel valued, and find a place to work where their opinions are listened to and they can pursue their passions. If they are struggling to find this in their current roles, try to connect them with a mentor. Look inside your network to find someone that can help them explore their interests, make connections and identify next steps for their career. When it comes down to it, as I have told my son, I don’t care WHAT he does as long as he is happy and is able to support himself. I want him to know the value of hard work, and to know that not everything he does is going to be fulfilling in the short term, but in the long run, what he does for a living matters. It is, after all, his life. I love that he is looking at jobs on places that he loves, but also in things where he can grow and flourish.